HOUSTON (KTRK) -- Crime Stoppers are asking for the public's help in identifying two suspects responsible for kidnapping, robbery and hit-and-run in north Houston. On April 10th, two Hispanic males wielding a pistol robbed a man outside a gas station located in the 9400 block of North Houston Rosslyn Road. The suspects approached the victim at the gas station and forced him into the passenger seat of his own vehicle. The suspect wielding the pistol entered the driver's seat and a second suspect sat directly behind the victim. The suspect with the gun took the victim's wallet and noticed his bank card. 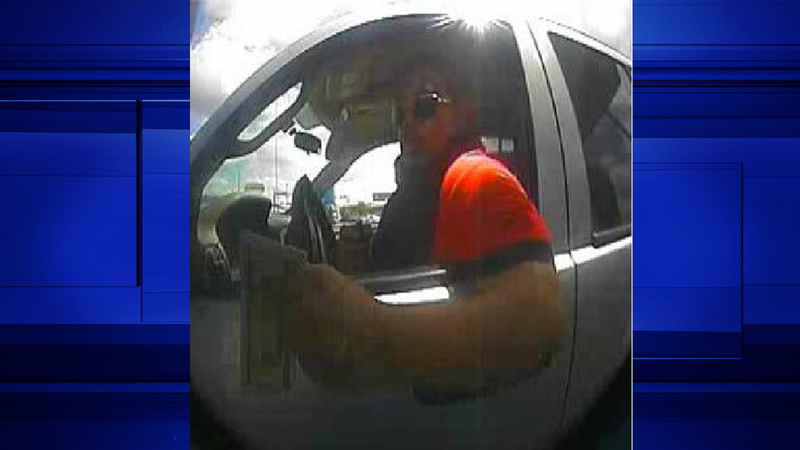 They drove the victim's vehicle with the victim as the front passenger, to a nearby ATM. They withdrew money from the victim's account, but then continued to drive around erratically with the victim still at gunpoint. As the suspects approached a red light, they struck a motorcyclist, who refused to move out of the way. The suspects then ran the red light to flee. They eventually pulled over and fled of foot abandoning the vehicle with the victim still inside. The victim was able to flee to safety from this location. The first suspect is described as a Hispanic male with short black hair. He is approximately 25-30 years old and 5 feet 6-8 inches tall. He was wearing sunglasses and a red shirt. The second suspect is also described as a Hispanic male that is approximately 5 feet 9 inches tall.